You are at:Home»Liner Stories»Ocean Liners»President or Prinz? President or prinz? That was the question facing Norddeutscher Lloyd (NDL) officials in 1907 when it was time to name their newest ocean liner. They eventually decided on the latter, naming the vessel Prinz Friedrich Wilhelm. 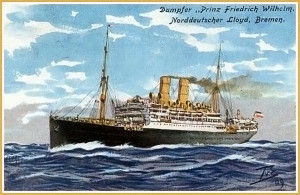 The liner Prinz Friedrich Wilhelm was originally going to be named Washington, but NDL officials, perhaps feeling some pressure from the Kaiser (who was keenly interested in boosting Germany’s naval and maritime fleets), changed their minds and gave the vessel a Hohenzollern name. The 590.1-foot-long, 68-fo0t-beam, 16,992-ton liner, launched on 21 October 1907, featured two funnels and a service speed of 17 knots. She offered accommodation for up to 46 first-class, 338 second and 1,726 third-class passengers.